We’d love your help. 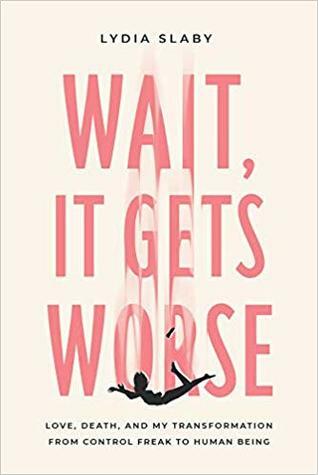 Let us know what’s wrong with this preview of Wait, It Gets Worse by Lydia Slaby. Lydia Slaby was thirty-three years old and had everything she believed would make her happy: three fancy private school degrees; a successful husband who was in the inner circles of Barack Obama’s presidential campaign; a high-paying job as an attorney—even an enviable yoga practice. But under the surface Lydia’s life was in free-fall. Her new marriage was one argument aft Lydia Slaby was thirty-three years old and had everything she believed would make her happy: three fancy private school degrees; a successful husband who was in the inner circles of Barack Obama’s presidential campaign; a high-paying job as an attorney—even an enviable yoga practice. But under the surface Lydia’s life was in free-fall. Her new marriage was one argument after another, she had a job she never wanted, and for some reason she had begun to rapidly lose weight and turn a strange shade of yellowish-green. When she made a doctor’s appointment to talk about the toll of extremestress, she was instead admitted with a diagnosis of lymphoma. To ask other readers questions about Wait, It Gets Worse, please sign up. Wait, It Gets Worse: Love, Death, and My Transformation From Control Freak to Human Being by Lydia Slaby is powerful & had me so intrigued throughout the whole book. Lydia’s writing is wise & smooth in this memoir. she writes about her journey with lymphoma, while piecing her marriage back together. the first few chapters rotate between her hospital days & her history with her husband, Michael. later chapters are Lydia figuring out how to live a life post cancer which includes anothe Wait, It Gets Worse: Love, Death, and My Transformation From Control Freak to Human Being by Lydia Slaby is powerful & had me so intrigued throughout the whole book. Lydia’s writing is wise & smooth in this memoir. she writes about her journey with lymphoma, while piecing her marriage back together. the first few chapters rotate between her hospital days & her history with her husband, Michael. later chapters are Lydia figuring out how to live a life post cancer which includes another surgery. Reading cancer memoirs is a strange hobby, I admit. But it’s one of mine. And this is a wonderful cancer memoir. Lydia Slaby is honest and straightforward. She is able to inhabit the key moments in her experience with cancer and to describe them without the gauzy hindsight that is common in looking back. I especially appreciate the way she confronts the illusion of control that is common to the young and the strong, and describes her process of learning to live without that particular untruth. Br Reading cancer memoirs is a strange hobby, I admit. But it’s one of mine. Bravo, and please write more! The description of the book drew me instantly, "that control is a lie" spoke to my inner control freak and outward perfectionist. As I began the book the chapter Hope spoke to me as more of an epilogue than a preface, but I forged on with the book despite that being rather off putting. Once I got into the book I simply couldn't put it down. I read the first 100 pages with ease, which is of course my personal favorite type of book. When I open a book and begin to read then check to see how many p The description of the book drew me instantly, "that control is a lie" spoke to my inner control freak and outward perfectionist. As I began the book the chapter Hope spoke to me as more of an epilogue than a preface, but I forged on with the book despite that being rather off putting. Once I got into the book I simply couldn't put it down. I read the first 100 pages with ease, which is of course my personal favorite type of book. When I open a book and begin to read then check to see how many pages, where is 10%? 20% 50% it doesn't bode well for the book. The only reason I actually put it down was sleep, a necessary habit of mine. I picked it up the following day and I was just struck with it's fluidity. I cannot say if it is a result of amazing writing, amazing editing or a combination of both. Even though the author will take a break to explain how they got to where they are, it fits perfectly and I never found myself asking why is that important now?!? Then again the story would naturally begin to flow forward and it seemed so natural, so unbroken, I never found myself asking questions or wondering, a huge pet peeve of mine that represents a story line with holes. In some ways the book reminded me of Gilda Radner's bio "It's Always Something"a favorite of mine, however Linda's descriptions of procedures while concise and honest were never grotesque. I greatly appreciated that. Like Linda I have had a few surgeries and I cannot look at the resulting wounds. The book itself had powerful messages about control, why we crave it and why we have to stop trying to "get back" and how to move forward. There were passages in the epilogue that just spoke to me, I marked them to allow myself to go back and reread them. You might not think a memoir about cancer could possibly be an enjoyable read but Wait, It Gets Worse will prove you wrong. Lydia Slaby is very open and honest with what was going on in her life, before, during, and after her cancer diagnosis and treatment. Looking in from the outside, Lydia seemed to have it all – a job as a lawyer that she loved, a marriage to a man she considered her soul-mate who worked for the Obama campaign, all the social and material trappings of success. But underneath You might not think a memoir about cancer could possibly be an enjoyable read but Wait, It Gets Worse will prove you wrong. Lydia Slaby is very open and honest with what was going on in her life, before, during, and after her cancer diagnosis and treatment. Looking in from the outside, Lydia seemed to have it all – a job as a lawyer that she loved, a marriage to a man she considered her soul-mate who worked for the Obama campaign, all the social and material trappings of success. But underneath the surface, her life was falling apart; her marriage was on the rocks, and the stress of her job left no time in her life for anything but work. And then, at 33, she got cancer. But wait, it gets worse. It really does – WAY worse!! In a conversational tone that makes her seem like a good friend, she talks about what she has experienced, how she felt about it each step of the way, and the lasting effects of it all. When all is said and done, she comes to the realization that having cancer just may have saved her life in a multitude of ways. This is an interesting, well-written and informative read. I am so grateful that she shared her journey with us, and even happier that now, her life truly seems to be on the right track. This book gets a 5-star rating from me! Many thanks to NetGalley and to Disruption Books for allowing me to read an e-ARC of this book in exchange for an unbiased review. The opinions expressed here are my own. The book will be available to the public on 3/19/2019. I'm not sure what led me to pick this books. I love the name and the cover, but honestly the subject didn't really interest me, but nonetheless I selected it and started reading. This writing style is friendly and relaxed. You feel like you are sucked onto her couch as she tells you this wonderful, powerful, emotional story about her struggles with cancer, recovery, herself, her relationship, her professional life etc. It flows and is easy to get just read multiple pages without even realizing. Th I'm not sure what led me to pick this books. I love the name and the cover, but honestly the subject didn't really interest me, but nonetheless I selected it and started reading. This isn't your typical cancer/survival story. She really just tells you about her. You can listen and walk away or you can choose to gleam more from what she's tried, gone through and learned. Whichever. It seems she would be happy with either and she's just happy to tell you her tale. Wow! Lydia Slaby! Your raw narrartive of all that you went through over the years is amazing. Your recollection of each hospital visit and procedure shows the pain that you went through. All while your husband stepped up to the plate to be by your side. Though this book is about a difficult time, Lydia's writing is very conversational; hence why she started a blog to document her journey. Since reading this book, I have visited the Hair Optional blog to see Lydia's progression. I think this nove Wow! Lydia Slaby! Your raw narrartive of all that you went through over the years is amazing. Your recollection of each hospital visit and procedure shows the pain that you went through. All while your husband stepped up to the plate to be by your side. Though this book is about a difficult time, Lydia's writing is very conversational; hence why she started a blog to document her journey. This was a very human, very raw book about facing Cancer, fighting it & trying to relinquish control in order to heal, not just physically but emotionally, mentally & spiritually. I particularly enjoyed reading the last section where she combines therapy and holistic methods to try and figure out how to rebalance. It's not too triggering and it is not overwhelmingly sad. I think it is the perfect balance for anyone wanting to reading a memoir - even if you have cancer, in my opinion, it w This was a very human, very raw book about facing Cancer, fighting it & trying to relinquish control in order to heal, not just physically but emotionally, mentally & spiritually. I particularly enjoyed reading the last section where she combines therapy and holistic methods to try and figure out how to rebalance. It's not too triggering and it is not overwhelmingly sad. I think it is the perfect balance for anyone wanting to reading a memoir - even if you have cancer, in my opinion, it wouldn't be too much. Wait, it Gets Worse... a beautifully written documentation of the author's incredible journey through an unexpected cancer diagnosis during the height of her corporate lawyer career. So many emotions! Heartbreak, joy, confusion, fear, anger, and many other struggles. She broke down every stage of treatment in easy to understand elements and explained how it affected her personally, professionally, and in her marriage. Note: I won this book on Goodreads.com. This book showed a personal struggle with cancer and the aftermath. I had never really thought about what happens AFTER cancer is gone. It moved quickly and had just enough detail to keep me interested. Good move, Lydia, to share! Thank you. This isn’t the type of book I would normally read. But I’m so glad I did. Lydia is open and honest about her struggles with cancer, as well as her marital strain prior to her diagnosis. By the end of this book, my heart had broken for Lydia and then mended again as she describes her journey of healing. What I appreciated most about this book was that Lydia was frank about what going through cancer treatment is like. By discussing her experiences, Lydia showed me how brave every single person wit This isn’t the type of book I would normally read. But I’m so glad I did. What I appreciated most about this book was that Lydia was frank about what going through cancer treatment is like. By discussing her experiences, Lydia showed me how brave every single person with a cancer diagnosis is every single day. I gained new found respect for my family and friends who, like Lydia, have had their lives radically changed by a cancer diagnosis. I highly recommend this book. I received a free copy of this book through the GoodReads giveaway platform. Lydia is a woman who has a perfect life. College, law degree, good job in a prestigious law firm, great husband. Except her marriage is in trouble. And she is having trouble breathing. And she is losing weight. A doctor’s appointment lands her in the ER being treated for cancer. And then open heart surgery. The heart surgery was what really got to me. Lydia is able to pull it together with the assistance of her family, her husband, her friends and an excellent health-care plan. In the end, she is able to rebuild her life the way it should be.